Kshama Sawant, an open socialist, won election to the city council in a major American city, Seattle, in November’s ballot. One would have to go back to the first half of the twentieth century to find anything similar in the United States. Sawant, who was born in India but moved to the United States and is now a U.S. citizen, ran as an activist. She first drew attention as part of the local Occupy protests that included taking over a downtown park and a junior collage campus in 2011. While Occupy as an organized movement has faded, many of those who were inspired by it have organized on other fronts. These include opposition to foreclosures, support to the strikes and demonstrations by fast food workers, and opposition to coal trains coming through the Seattle area for Asian export. Sawant has been in the midst of these actions as a vocal champion, and it was these activists who formed the backbone of her campaign. A few days after her victory in the tight race was confirmed, the new city council member stood with Boeing workers rallying in struggle against the company. Boeing’s International Association of Machinists workers had voted down a concession’s contract by a large majority. 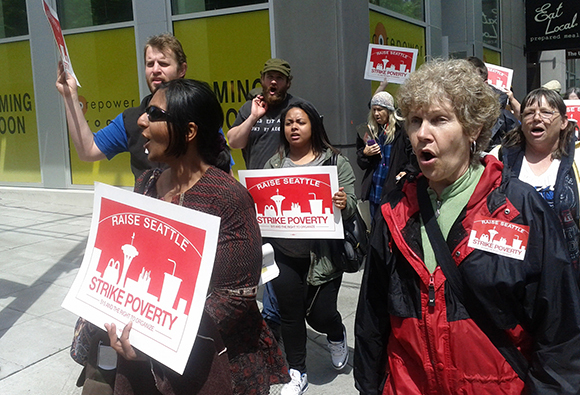 Sawant’s campaign centered on a program of immediate demands relevant to the continuing recession workers face in the situation of deepening inequality as the capitalists are reaping high profits, and the stock market has reached historic highs. There were three central demands: a raise of the minimum wage to $15 an hour, controls to curb skyrocketing rents in Seattle, and a tax on millionaires to fund a public transit system and other city projects. Such demands, and others which socialists can develop, point in the opposite direction of the austerity pathway the Democrats and Republicans are charting. These demands struck a chord, as did her denunciation of the Democrats and Republicans. The whole country has seen the two parties of capital fail to address the needs of the “99 percent” while the “1 percent” has been coddled during the Great Recession and its aftermath. Even the man she defeated, 16-year Democratic Party incumbent Richard Conlin, said after the election, “I don’t think socialism makes most people in Seattle afraid.” Recent polls also show that some 60 percent in the 18-29 age group favor socialism over capitalism when presented with that alternative. This should not be overstated. Sawant’s victory and these polls do not mean that socialism is well understood, or that large numbers now consider themselves to be socialists. Socialist organizations have been losing members, and the socialist label is anathema to many, especially in less progressive areas of the country. But it does show socialists can make inroads with concrete proposals, and there is an audience for socialist ideas. Seattle is a solid Democratic Party city. This meant that Sawant did not face the obstacle of “lesser evilism,” whereby people are cowed into voting Democratic lest a Republican would win. The race was between a Socialist and a Democrat. Seattle now has a two-party council, without a Republican in sight. Sawant’s campaign began modestly. She was able to utilize the fact that Seattle is a one-party town to point out that party must serve the interests of the capitalist who run the place. She said, “the Democratic Party machines…totally run these cities in the interests of the rich and powerful,” declaring Conlin to be a “corporate-pandering politician.” As the campaign wore on, this became increasingly obvious. “Conlin garnered donations from every single corporate real estate interest, downtown law firm, commercial construction magnate, railroad honcho, and so on,” one commentator noted. Sawant rejected such donations. But as her campaign gained steam, her activist base raised a considerable sum of $125,000 (still less than Conlin spent). Conlin also had the support of the Seattle Times (the major newspaper), the Democratic Party district committees, several unions, the mainstream environmental organizations, and the other elected officials. 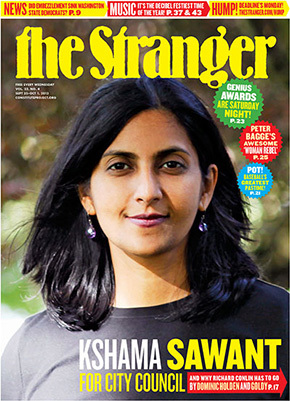 Sawant was initially educated in Mumbai, India, and then in the U.S. She teaches economics at Seattle Community College. The American Federation of Teachers local there endorsed her, as did a local of the Service Employees International Union (SEIU). She was also endorsed by the Stranger, a community newspaper that appeals to the young, the radical, and LGBTQ people. But as her momentum grew, there were some interesting defections. 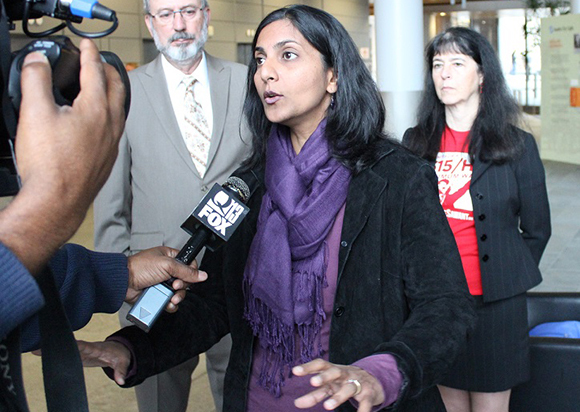 Some Democratic officials broke ranks to support Sawant, despite Conlin’s cries of foul. Then the county central labor council voted 28 to 21 to endorse the socialist, not enough for the two-thirds needed for formal endorsement, but enough to make headlines. Then Conlin himself came over to support a $15 minimum wage, as did the two Democrats vying for mayor. Kshama Sawant ran as the candidate of Socialist Alternative, an affiliate of the Committee for a Workers International (CWI) based in Britain. The CWI considers itself Trotskyist. Her campaign was endorsed by Solidarity and the International Socialist Organization. It is to be hoped that similar efforts can bring together revolutionary socialists of different backgrounds in the United States in common work and discussion. Hopefully there will be discussion on how to replicate this across the USA. SAlt have a huge challenge wheter to build a bigger small group or do something bigger in conjunction with a lot of the rest of the left.